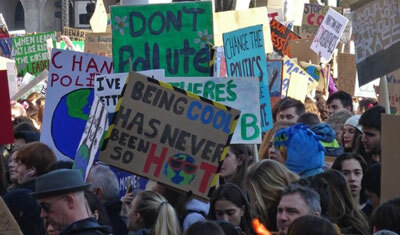 With almost 1.5 million children striking from school on Friday 15th March, conversations about climate change have been brought firmly into the home and around the dinner table. But how does climate change affect what is on our dinner tables in Scotland? As the demand for Scottish salmon and global sea temperatures increase, it has never been more important to understand the impacts that climate change will have on the Scottish salmon farming industry. Climate change is defined as being a statistically identifiable change in climatic state over a period of time that typically spans at least a decade . Changes in climate can either result from both natural variability and human activity, but￼ both the IPCC and the United Nations’ Framework Convention on Climate Change unequivocally express human activity is the primary cause . UK agricultural and aquaculture industries, which are important domestically and for exports, will be considerably impacted by changes in climate. In 2016, Scottish salmon farming generated £1.8 billion for the economy, and the Scottish Government plans to double this to £3.6 billion by 2030 . Will this be possible given changes will take place throughout the industry as climate adaptation measures are introduced? Scottish Natural Heritage (SNH) warn that for Scotland “increasing ocean temperatures and ocean acidification are the main consequences of climate change”, as well as increasing CO2 levels in the marine environment , unavoidably causing problems for the Scottish salmon farming industry. US National Oceanic and Atmospheric Administration (NOAA) data shows that average global sea surface temperatures increased by approximately 0.13°C per decade over the past 100 years . Not only do increased temperatures cause changes in spatial distribution of wild species, but temperature fluctuations will also enhance conditions for bacteria harmful to fish stocks. Even small changes in temperature can modify the metabolism, growth, fertility and behaviour of fish . Temperature rises will increase the growth and breeding rates of parasites, diseases and algal blooms, that all impact salmon health , especially in the close, confined spaces of open net pens on Scottish salmon farms. Wild marine species with a preference for warmer or cooler waters are likely to change their habitat and migratory routes, altering the chemical make-up of the water, and the balance of ecosystems, including those surrounding salmon farms . Globally, levels of disease in fish have increased over the last thirty years, including the emergence of previously unseen infections. Whilst there may be several reasons for this, water temperature is a significant factor . It also has a marked effect on the toxicity of many antiparasitic pharmaceuticals, which will impact how effective they are against parasites, and how much they impact other, wild organisms in the marine environment . Extreme weather events can include unusually high temperature, heavy rains, severe storms and droughts . Unsurprisingly, severe storms can cause damage to salmon farm infrastructure, battering equipment and leading to rips in the net cages leading to salmon escapes and mortalities. In June 2015, Mowi Scotland (previously Marine Harvest Scotland)  detailed a loss of 16,000 salmon due to net damage after a severe storm . Escapes of this size could have a detrimental impact on wild salmon populations due to the risk of crossbreeding contributing to a reduction in genetic diversity affecting biodiversity, as well as the spread of disease . Relatively small changes in mean air and sea temperatures can result in disproportionately large changes in the frequency of extreme events. An interactive tool developed by Carbon Brief  displays information for scientific evidence-based impacts relating to a 1.5 and 2°C warming, as well as 3°C where information is available. This tool highlights that with 1.5°C warming, there would be an increase of category 4 cyclones by 2.1 %, and that 28 million living in coastal areas would have their homes flooded by 2055. This would increase to 60 million by 2095. According to the James Hutton Institute  14-18% of Scotland’s coastal populations live in the north-west of Scotland, where Scottish salmon farms are located. In 2017, 1,431 people were employed by the industry , a significant number considering the rural nature of these communities. Rising sea levels and increased storms would not only risk physical damage of their homes and places of work, but there would also be serious economic implications if the industry was unable to continue to support these levels of employment. Increased CO2 levels in the atmosphere lead to ocean acidification as the sea absorbs, and dissolves, greater amounts of CO2. The NOAA  highlights that this will negatively affect cold-water corals and reefs in Scottish waters. Reefs absorb and reduce energy from storm waves protecting shore lines and fish farms from storm damage. Having a varied and healthy ecosystem around farms also ensures a stable environment for the salmon, reducing the occurrence of diseases and parasites. Given the uncertain future for Scottish salmon farming in this changing climate, businesses must plan for and invest in resilient infrastructure and solutions to adapt to the increased water temperatures and extreme weather events coming. In comparison to other forms of animal agriculture and fishing, salmon farms in Scotland are relatively low carbon as they are not dependent on land use and fuel-heavy fishing fleets. Regardless, all sectors must work towards mitigating climate impacts to ensure a safe environment for the ‘School-strikers’ to grow up in and ensure food security for a growing population. This is why Fidra is asking retailers and industry to increase their levels of transparency around the technologies and processes they use to produce the Scottish salmon on our dinner tables. We are asking Scottish salmon farms to collaborate on a sustainability dashboard to show their performance across a , a range of environmental criteria including a climate change mitigation plan. To find out more, visit our retailer page and other blogs. Cochrane, K., De Young, C., Soto, D. and Bahri, T., 2009. Climate change implications for fisheries and aquaculture. FAO Fisheries and aquaculture technical paper, 530, p.212. Mohanty, B., Mohanty, S., Sahoo, J. and Sharma, A., 2010. Climate change: impacts on fisheries and aquaculture. In Climate change and variability. IntechOpen. Urbina, M.A., Cumillaf, J.P., Paschke, K. and Gebauer, P., 2018. Effects of pharmaceuticals used to treat salmon lice on non-target species: Evidence from a systematic review. Science of The Total Environment. Rosenzweig, C., Iglesias, A., Yang, X.B., Epstein, P.R. and Chivian, E., 2001. Climate change and extreme weather events; implications for food production, plant diseases, and pests. Global change & human health, 2(2), pp.90-104. Karlsson, S., Diserud, O.H., Fiske, P., Hindar, K. and Handling editor: W. Stewart Grant, 2016. Widespread genetic introgression of escaped farmed Atlantic salmon in wild salmon populations. ICES Journal of Marine Science, 73(10), pp.2488-2498.